More than 150 countries around the world have begun a synchronized switch to a different oral polio vaccine, an important milestone in the effort to eliminate the disease. The polio virus mainly affects children aged five and under. The highly contagious disease can invade the nervous system and paralyze susceptible children. Pakistan and Afghanistan are the last two countries where polio continues to have a foothold and remains endemic. There have been 12 cases there so far this year. About 25 years ago when the polio eradication program began, about 350,000 children were being paralyzed by it every year, said Reza Hossaini, chief of polio at UNICEF. The vaccine in use successfully for more than 30 years contains protection against three types of the virus. Since Type 2 hasn't caused a case in the wild since 1999, it didn't make sense to continue to immunize people against it. The goal is to interrupt transmission of the virus by the end of this year. By 2019, the target is global certification of polio eradication. "The job has not been done and will not be done until we have fully eradicated the virus," said Michel Zaffran, director of polio eradication for the World Health Organization. That's because any remaining cases risk reintroducing the virus to other parts of the world, Hossaini said. "It's the first time that such global synchronized effort … is taking place," Hossaini said in an interview from Copenhagen on Monday. By working with the local community leaders in Pakistan, local vaccinators were able to overcome resistance to immunization against polio and reach children who were previously missed, he said. "Sometimes they also risk their lives to go to those areas," Hossaini said of local vaccinators. In February and March, vaccinators were met with less resistance among families. In the last two or three years, northern Nigeria also achieved a high level of vaccine coverage, which needs to be maintained with the same level of intensity, so no child is left without immunization, campaigners say. 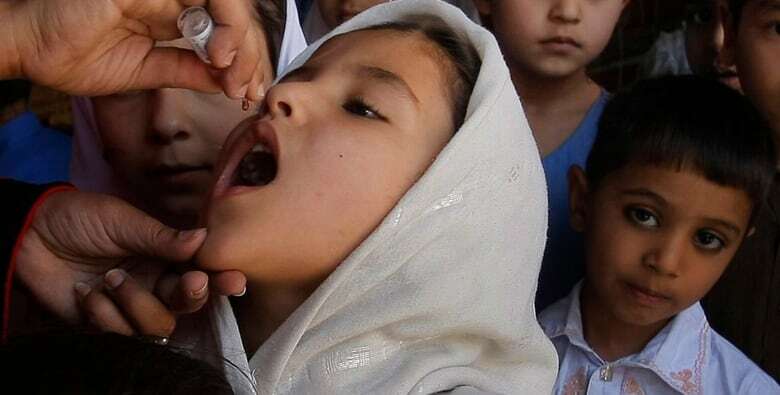 In rare cases, children can contract polio from the weakened virus in the oral vaccine itself, Hossaini said. That's why it's so important to co-ordinate the switch to remove the vaccine with Type 2 polio across 126 countries, including those with the largest populations, such as China, India, Brazil and Nigeria. Teams on the ground will monitor how the old vaccines are destroyed by heat and light. The new vaccine eliminates all possible traces of Type 2 polio. Hosseini acknowledges a risk. "The fear is there. The possibility of having outbreak is there. That's why we have prepared an outbreak response plan." Children who are vaccinated but immunodeficient could continue seeding the virus from the vaccine itself to others. The response plan includes keeping some of the old oral Type 2 vaccine, as well as inactivated poliovirus in injectable form, he said. The switch is the first major step toward the eventual removal of all oral polio vaccine worldwide after wild polio transmission ends. The eradication effort is well worth it for Mohan Anand of Oakville, Ont. Now in his mid-70s, Anand contracted polio in India when he was one. Now with effects of post-polio syndrome, he walks with a limp. "Not being able to do even things like walking properly or running, it gives them a depressed feeling in their minds, so luckily that kind of feeling will not be there in the minds of the children," Anand said. "It's superb." Achieving the goal will take about $4 billion US and there's a gap of $1.5 billion US still to raise, Hosseini said, as well as continued support from governments like Canada's for advocacy and to mobilize resources.